If you compete online in the retail electronics industry, there is ample opportunity, according to a study completed by Conversion Sciences and Marketizator. The full report, Optimization Practices of Retail Electronics Websites, can be downloaded for free. It is the latest in our series of industry report cards that include reports on Higher Education, and B2B Ecommerce. Retailers of digital cameras, TVs, home theater, and tablets. Retailers of complimentary products, such as computers and laptops. We believe that the lessons learned here can be applied to any online retail business with high-prices and commoditized products. Why Focus on Website Optimization? There is a set of tools and disciplines designed to increase the number of sales and leads generated from the traffic coming to a business website. Collectively, they are called website optimization. Reduce shopping cart “abandonment” in which visitors add items to cart, but do not purchase. Decrease bounce rates for traffic from paid advertising. Website optimization utilizes easily-collected information to identify problems and omissions on these sites that may prevent achievement of these goals. Web analytics tools track prospect’s journey through a site. Examples include Adobe SiteCatalyst and Google Analytics. 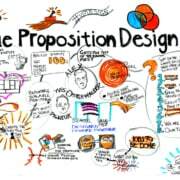 The existence of these tools on a website indicates that the site is collecting important information that can be used to decrease the cost of acquiring new prospects and customers. Businesses reliant on SEO aren’t as vulnerable to algorithm changes. This report targets companies investing in search advertising in a variety of formats. How much are these businesses pending on paid online advertising? 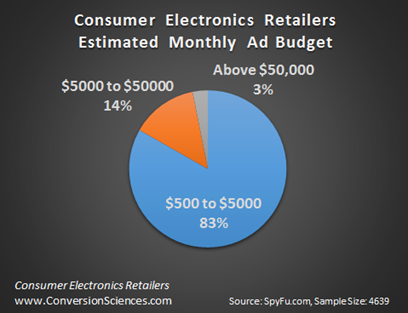 Of the businesses competing for consumer electronics sales, 83% are spending between $500 per month and $5000 per month on paid search ads. See Figure 1. Fourteen percent are spending between $5000 and $50,000 per month, and only 3% spend more than $50,000. Figure 1: Range of spending on paid search ads by businesses. Of the organizations that spend at least $500 per month on search ads, 75% have some form of Web Analytics installed on their site. Web Analytics is a broad category of web software that in some way measures the behavior of visitors to a site. It includes most of the website optimization tools discussed in this report. Figure 2: Breakdown of web analytics installations by ad spend. When we break the list down into categories of spending, we find that the highest-spending organizations are less likely to have web analytics installed (77%) despite having the most to lose. Google Analytics, a free tool, is the most pervasive analytics package, found on 77% of the sites with analytics. Adobe SiteCatalyst (formerly Omniture) is installed on 4.5% of these sites. By looking at the software installed on the websites in the asset and inventory marketplace, we can get an idea of how these organizations are investing in the tools of optimization. This doesn’t tell us how many are making good use of these tools, but indicates how many have the potential to optimize their site. optimization tools. Of this segment, 24% have at least one of these tools installed vs. 7.7% for the entire industry. 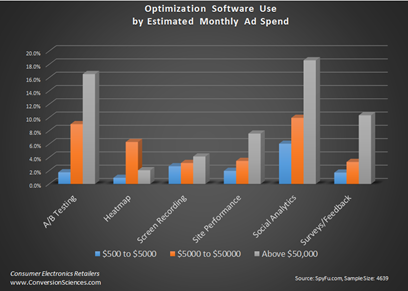 The largest spenders focus investments on A/B testing tools, social analytics and survey feedback solutions. Figure 3: Adoption rate of Web optimization tools by ad spend. It is clear from the information presented here that, the largest group of retailers – those spending between $500 and $5000 each month on search ads — invest the least in AB testing tools. Furthermore, they invest most in social media analytics tools with 6.1%. The question is this: Do they not have the tools budget because they don’t invest in website optimization, or do they not have the tools because they don’t see optimization as important. 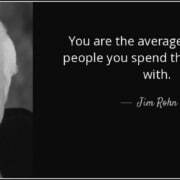 Certainly, both are true for some portion of the sample. 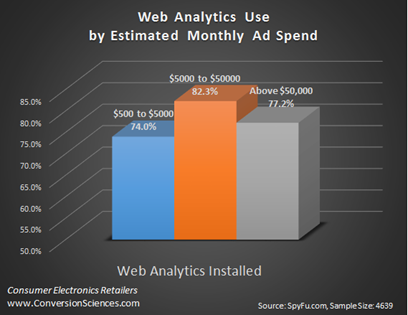 However, 75% of all organizations spending at least $500 a month have web analytics installed. At some point, most of the industry came to the conclusion that you must understand the basics of your traffic. Yet, only 7.7% have at least one website optimization tool installed. Over 82% of organizations spending between $5,000 and $50,000 have web analytics installed, and 15.6% have some sort of investment in optimization tools. Most of the businesses in our review – 75% – have gotten the message that web analytics should be installed on their website. The majority of these have installed Google Analytics, a free package with capacity to capture the behavior of their visitors. The value of an analytics database like this is in the insights it can provide. Incentivizing your team to glean insights from this analytics database will guide online investment decisions, increasing the performance of the website. Those businesses with larger ad spends are able to bid more for better placement on their ads. Those with smaller budgets, however, will win by reducing the overall acquisition cost. Businesses with low acquisition costs get more inquiries for less money. This is the leverage businesses with fewer resources need. Those businesses that learn to optimize the fastest will gain a cost advantage in paid ad auctions. An investment in free and inexpensive tools, such as click tracking, screen recording and site performance solutions will tip the scales. Given the low adoption rate of so many of these tools, schools with few resources are in a position to disrupt their competitors by investing in them. For those businesses with higher average order values, small increases in conversion rates will deliver big increases in revenue. In short, it takes less time to get your money back from an investment in website optimization. This can be seen in the relatively high adoption rate of A/B testing tools by businesses spending between $500 and $5000 per month (21%). While these tools require a more formal discipline, they are very effective at finding increases in conversion rates month after month. There is still a significant opportunity for businesses spending below $5,000 to drive acquisition costs down with testing. Google favors sites with better performance. The search engine gives advertisers with more relevant sites ad placement higher on the page. Data indicates that sites with lower bounce rates are given a higher quality score than sites that elicit “pogo-sticking”, that is, sites for which visitors are returning to search results pages quickly. Website optimization will reduce bounce rates by getting visitors into the site before they jump back to their search results. It is telling that social analytics tools have the highest adoption rates among consumer electronics retailers. Social ads are delivering qualified traffic at a relatively low cost. In our experience, social sharing has not. Your analytics will reveal if social traffic is delivering new leads and sales for your business. If the results aren’t there, consider using this investment elsewhere. Retail marketers are clearly behind the curve in terms of their adoption of website optimization tools. This creates an opportunity in the market. However, this window will close. As more businesses begin optimizing, it will become harder more expensive to compete for prospects online.